One piece plastic handle and backing plate. Bonded foam pad, designed for sanding drywall joints. Used for pre-cut or a half sheet of sandpaper. Easily converts Norton hand sanders to pole sanders for extra flexibility in stairwells, on ceilings and hard to reach areas. Structural foam with stainless wire clips. New integral molded pad. Uses DWS drywall sheets or 1/2 sheet of sandpaper. 9" x 3.375" x 3". Made of molded plastic. A comfortable lightweight tool. For use with die-cut or a half sheet of standard sandpaper. Attaches to any standard size wooden or metal pole, such as a broom handle. The pivoting head is perfect for hard-to-reach areas when sanding vertical joints & ceilings. Includes aluminum clamps, steel bolts and a black foam pad. Fits sandpaper sheet size 3-1/4?W x 11?L. Made from lightweight injection molded plastic. Can be used with any standard 3/4" broom handle. Flexibility, and durability. 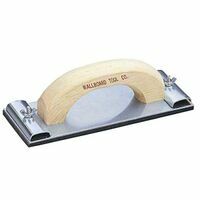 Used for sanding drywall joints. Durable, lightweight, yellow plastic allows uniform pressure to be applied when sanding. Assures smooth, even drywall joints. Use with 3-5/16" x 11" die-cut abrasive sheets or mesh. Attaches to most threaded poles. Use with 3-5/16" x 11" die-cut abrasive sheets or mesh. Heavy-duty, reinforced plastic sanding base. 4-way swivel threaded adapter. Can be used with any standard 3/4" handle. Wallboard Drywall Rasp, Lightweight, Professional Grade, Ergonomic Handle, Plastic Handle, 6 in Overall Length, 2 in Overall Width, Plastic Made from hardwood with a hammerhead tip. For Use With: pole sanders #14428, #14426 & #14660 Heavy-duty aluminum body with comfortable wood handle. Sand ceilings and walls with both feet on the floor; structural foam with stainless steel wire clips; fits any mop or broom stick; lightweight; integral molded pad. Guide rails keep rasp on edge and prevent injury. Removes 45 percent more material per stroke than other popular rasps. Will not clog or collect dust, works in both directions. Long-lasting premium stainless steel blade. Contoured DuraSoft handle ensures a good grip. Applications: Drywall, Backer Board & Vinyl Tile. Rust resistant backing plate bonded to foam rubber pad. Smooth contour handle. Exclusive one piece handle clamp design for easy sandpaper attachment. Uses die cut or a half sheet sandpaper. MintCraft Pole Sander Head, Swivel, Aluminum Ideal for sanding larger surface areas; the light-weight, circular design virtually eliminates flipping and allows change of direction up/down and left/right without lifting off the wall; works with a 9" hook and loop sanding disc. Comfortable overmold handle with "EasyClamp" system for quickly changing abrasive sheets; aluminum backed rubber sanding pad; rubberized handle allows for more powerful sanding. Smooth rough edges with this convenient pocket-size rasp; also used for finishing soft metals and rough wood surfaces. Lightweight aluminum backing plate bonded to foam pad. 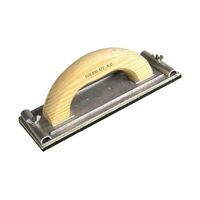 DuraSoft handle provides soft feel; uses die cut or a half sheet sandpaper. Sands both inside seams of a drywall corner; the light-weight, 90 degree design provides a smooth edge with less risk of wall damage commonly caused by sanding each side separately; works with 8" x 7" hook and loop sanding sheet. 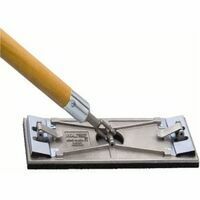 High quality, lightweight aluminum pole sanding head; unique "Easy Clamp" system allows for quick sheet changes; uses 3-1/4" x 9-3/8" abrasives sheets; Acme threaded female end fits standard broom handles and extension poles. Sand surfaces without creating a mess. Attaches to a standard shop-vac. Lightweight. Swivel control, clog-free suction, built-in vacuum control (Vacuum not included) and fast 'EasyClamp' system for changing abrasive sheets. HEPA filter recommended but not included. Kit Includes: Pole sander; 6' flexible hose, coupling adapters (in 2 sizes) & sheet of 3-1/4" x 9" medium grit, reversible drywall sand screen. 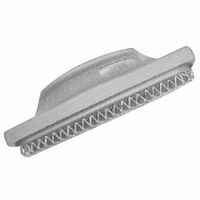 Use with standard wet/dry shop vacuum cleaners with 1-1/4" diameter hose and open-mesh sanding screen. 6" flexible hose adapter with adjustable suction valve. Made of reinforced die cast aluminum bonded to a foam rubber pad. Fast, positive clamps lock securely to hold sandpaper in place. Applications: Sanding drywall joints. Allows drywall sanding without harmful dust. Fits all shop type vacuum cleaners. Features 'Easyclamp' system for faster, easier abrasive loading. Universal thread for use with any extension pole. Kit Includes: Pole sander; 6' Flexible Hose, Coupling Adapters (in 2 sizes) & Sheet of 3-1/4" x 9" Medium Grit, Reversible Drywall Sandscreen. Telescoping fiberglass pole with multi-channel rubber sole plate eliminates dust particles from ceiling and walls, up to 10 feet high. Use with standard wet/dry canister vacuum cleaner and, open mesh style sanding screens to create a dust free drywall sanding system.